A limited number of lots now selling from just $159,000 – now is the time to act. EIG Developments is transforming 57 hectares of land in the new Opalia estate, Weir Views, into an affordable housing hub. The next land release expected to be within the next six weeks and once complete the estate will comprise of 586 houses. Opalia is a masterplanned residential community unlike anywhere else, offering new land and home buyers an abundance of choice. Set to open 2020, Opalia’s on site Shopping Centre features Woolworths, Chemist Warehouse, McDonalds and an abundance of specialty stores. Only Opalia offers the convenience and community of a complete neighbourhood with everything you need right at your doorstep. Opalia is the heart of Weir Views, Melton. 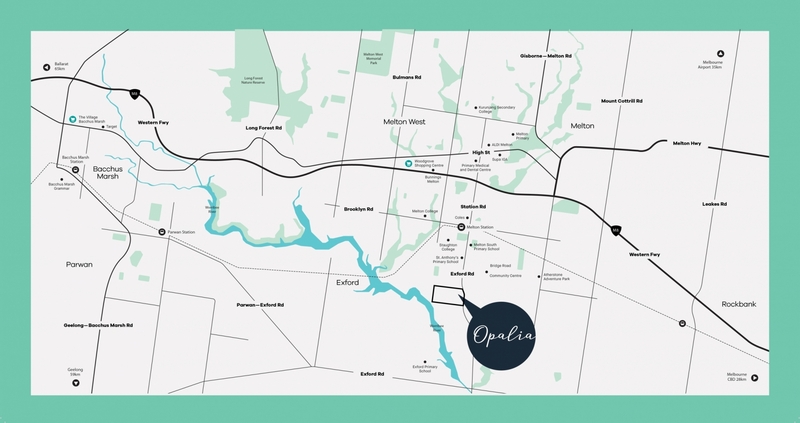 Opalia is just a few minutes away from the Melton Train Station and the centre of Melton – a thriving metropolis that continues to grow as more and more people discover this idyllic side of Greater Melbourne. With connecting pathways, two proposed sports ovals and green spaces dotted throughout, everything has been considered for an active life. This is a place where children can get into cricket in the summer and soccer in winter, or just enjoy time outdoors surrounded by a friendly community of families. Looking for a Home & Land Package? We’re currently working with some of Melbourne’s best builders to bring you an array of Home and Land packages designed to suit everyones lifestyle and budget. Contact us today to find out more information and to let us help you find your dream home.